My intention is not to go deeply into the nuance of PowerShell. I am going to get you started working on PowerShell right away. With such a simple introduction, I hope you'll be interested enough to dig deeper into the world of PowerShell on your own. 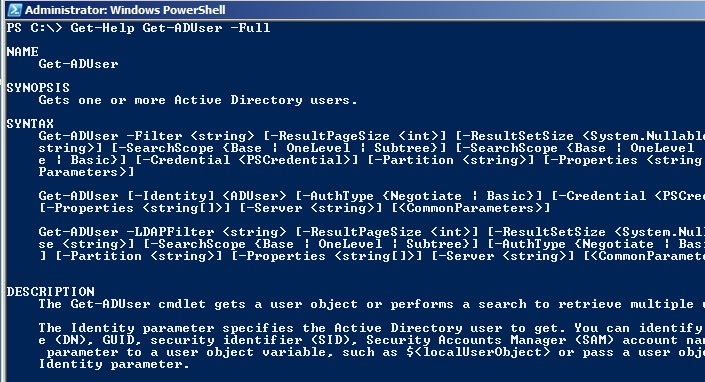 So we can start with The Active Directory (AD) module.. The Active Directory (AD) module is available by default with Windows 2008 R2 server (With the AD DS or AD LDS server roles.) . It can be installed as part of the Remote Server Administration Tools feature on a Windows 7 computer. If you are getting following error, that means the ActiveDirectory module is not installed on the computer or the module files are not available at the PowerShell module path. Import-Module : The specified module 'Activedirectory' was not loaded because no valid module file was found in any module directory. To ensure that you have the Active Directory module available for import, you can run the Get-Module –ListAvailable command in Windows PowerShell console. You can use the Get-Command cmdlet to retrieve all AD cmdlets. Help <cmdlet name> -Full to get the complete help of the command. Get-Help <cmdlet name> -Online will take you to the online help at Microsoft TechNet Library which will have a updated version of help. Get-Help <cmdlet name> -Examples will return the examples of the cmdlet. 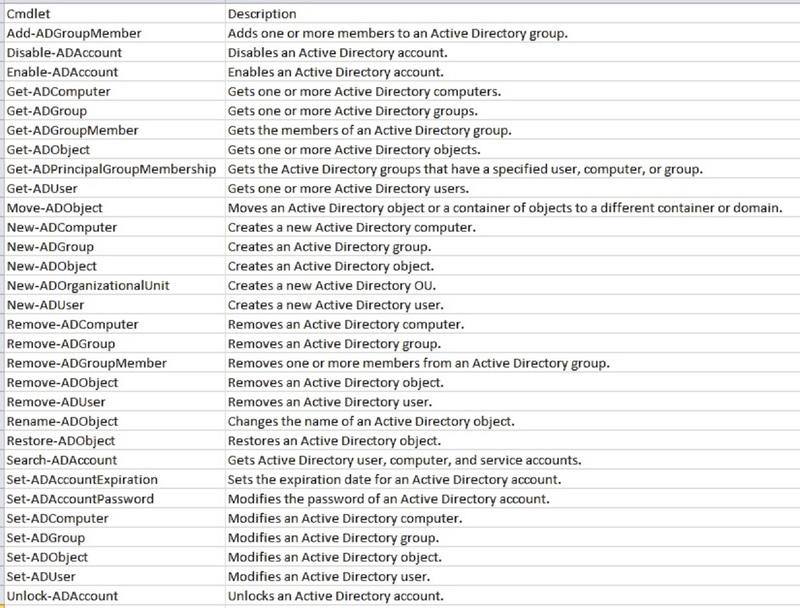 Following are the few cmdlets which we use frequently for the administration of Active directory objects. For demo, I am using Get-ADuser to query Active Directory for all user objects..
Get-ADuser -Filter * will return all user objects in your AD. By default the command will return the ten properties of the user object displayed in above screenshot. If you need to return additional properties you need to use -properties parameter. For Example, Get-ADuser -Filter * -Properties Manager will return Manager Property in addition to the ten default properties. You may add multiple properties with -Properties parameter, for example. Get-ADuser -Filter * -SearchBase "OU=Users,OU=HQ,DC=Max,DC=com"
To save the result to a csv file, you can use the Export-Csv command. To select specific properties while exporting, you can use Select-Object command. Following command only export the properties 'Manager,DisplayName,Company' of all user objects to a csv file. To read more about –Filter use following command. Following command will display all user account which does not have the Company attribute value set. The cmdlets also support Ldap filter via the -LdapFilter parameter..
That's all for now. See you in next article.. I appreciate the time you took to read my article, please leave your valuable feedback. Thanks in advance!..